Mahsati Ganjavi (Persian: مهستی گنجوی‎‎), (born c. 1089 in Ganja, a city in Arran, modern Republic of Azerbaijan-died after 1159) was a 12th-century Persian  poet. Mahsati (مهستی) is a compound of two Persian words "Mah/Maah" (Moon) and "Sati" (Lady). The word appears in the works of Sanai, Nizami, Attar, Rumi, and Saadi,. As an eminent poet, she was composer of quatrains (ruba'is). Originated from Ganja, she was said to have associated with both Omar Khayyam and Nizami. She is also said to have been a companion of Sultan Sanjar. Her alleged free way of living and peddled verses have stamped her as a Persian Madame Sans-Gêne . Her purported love affairs are recounted in the works of Jauhari of Bukhara. It is also known that Mahsati was persecuted for her courageous poetry condemning religious obscurantism, fanaticism, and dogmas. Her only works that have come down to us are philosophical and love quatrains (rubaiyat), glorifying the joy of living and the fullness of love. 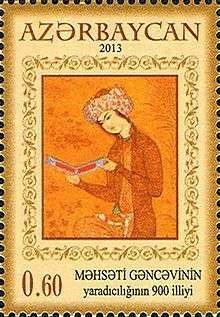 The most complete collection of her quatrains are founded in the Nozhat al-Majales. Approximately 60 quatrains of her are found in the Nozhat al-Majales. A monument to her was placed in Ganja in 1980. ↑ Bruijn, J.T.P. de. "Mahsatī." Encyclopaedia of Islam, Second Edition. Edited by: P. Bearman , Th. Bianquis , C.E. Bosworth , E. van Donzel and W.P. Heinrichs. Brill, 2009. excerpt: "a Persian female poet whose historical personality is difficult to ascertain. " ↑ Edward Brown, A literary History of Persia in Four Volumes. Cambridge university Press 1969. R. M. Chopra, " Eminent Poetesses of Persian ", Iran Society, Kolkata, 2010.